I had been trying to make everything so far without turning on my oven, because it’s summer and I didn’t have air conditioning, and in a tiny studio apartment you’ll basically bake yourself to death using the oven. However, on Tuesday when the temperature outside hit 98 degrees and humid, and the temperature INSIDE my apartment hit 95 even with three fans going, I broke down and ran out to buy an AC. So now I can use the oven! Time to experiment with vegan muffins for breakfast. 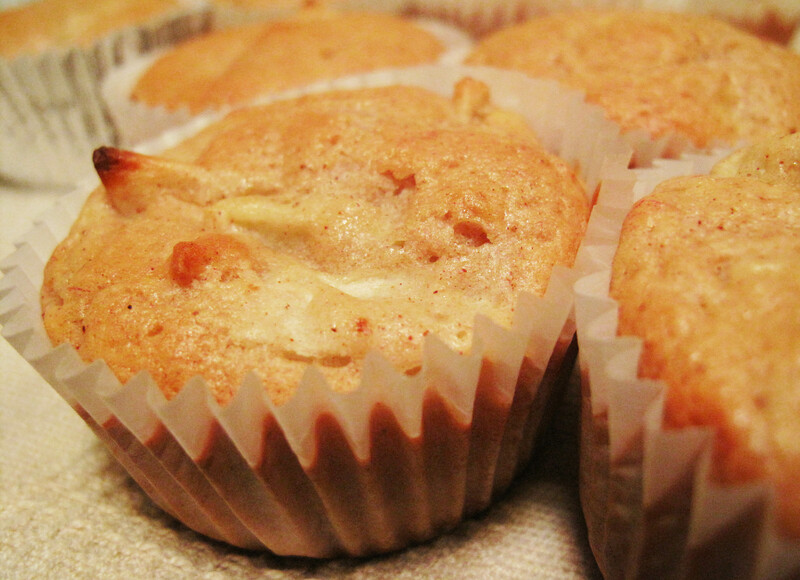 I chose an apple banana muffin recipe because the ingredients were super simple. Preheat the oven to 325 and lightly grease muffin pans. Combine 2 cups flour, 4 tsp baking powder, 1/2 cup sugar, and 1/2 tsp cinnamon and mix (I also added a dash of nutmeg and cloves). In a separate bowl, mash two ripe bananas and combine with 1 1/2 cups of apple juice and a diced apple. Add the wet ingredients to the dry and mix just until blended. Fill each muffin cup about 2/3 of the way and bake for about 35 minutes or until brown on top. They didn’t rise very much, but I think they were pretty good for being fat free AND vegan! You can’t go vegan without trying to cook with tempeh and seitan, so today I went for a tempeh recipe: Tempeh “chicken” salad. When I got to the store, I realized there are many different flavors of tempeh – soy, flax, garden veggie, three grain, wild rice, or smoky strips (fakin’ bacon). I chose three grain; it sounded like the best option to me for fake chicken salad. I followed this recipe but used a little cilantro instead of parsley, added more celery, and reduced the amount of vegenaise. Served with baby arugula on a whole wheat pita. It was good, but didn’t taste a thing like chicken. Also, I would leave out the pickle next time. It’s Thursday night Brooklyn Bridge Park free movie night (Ghostbusters!) so tonight’s dinner was a picnic with a group of six friends. My contribution was homemade hummus and pita chips and “tabouleh boats,” a quick appertizer idea I got from my friend Erika (it’s just boat-shaped endive leaves filled with tabouleh – a middle eastern salad of bulgur, parsley, tomato, onion, mint, lemon, and olive oil). I’ve made hummus before, but I wanted to see if there was a recipe that didn’t require tahini. It’s annoying having leftover tahini around, because the only thing I can think to do with it is, well, make more hummus. So of course, Heidi Swanson to the rescue – she has a recipe that uses ground toasted walnuts instead of tahini. Put 3/4 cup toasted walnuts (just toast chopped walnuts in a pan for a few minutes until they start to get that toasty smell) in a food processor and pulse it a few times. Add two cups of cooked drained garbanzo beans, a clove of garlic (or more if you like – I do! ), 1/2 cup of extra virgin olive oil and the juice of half a lemon. Process until smooth and then add about 1/2 cup of hot water slowly until the hummus is creamy. Add more lemon and salt to taste. Serve with pita chips (I baked whole wheat pita in the oven for 15 minutes at 350 with olive oil, salt, and pepper) or veggies. Garnish with paprika, some extra garbanzo beans, a drizzle of olive oil, pine nuts, or any combination of those. 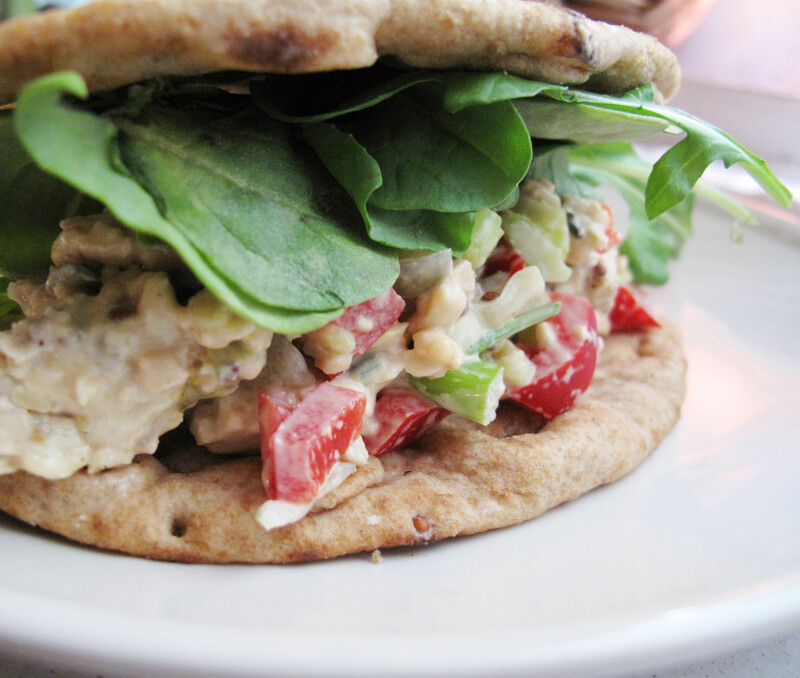 I do think I like the taste of tahini hummus better, but the walnut version was cool to try. This entry was posted in Cooking adventures, Vegan and tagged breakfast, salad, sides, vegan, vegetarian. Bookmark the permalink.